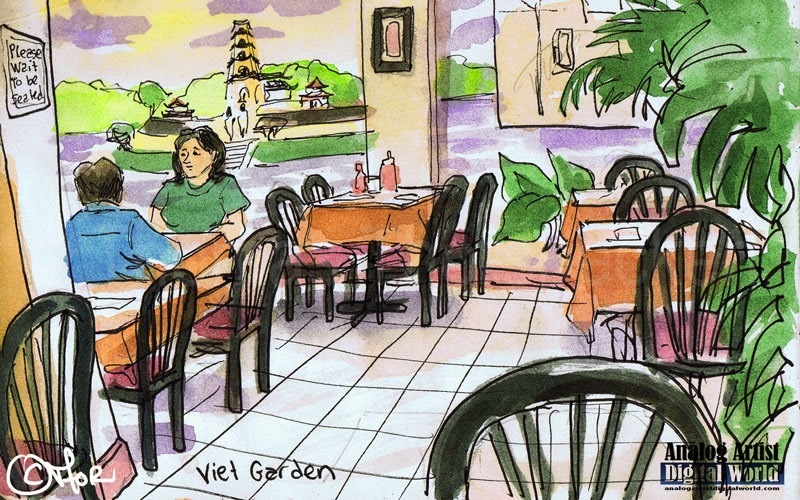 Anytime I find myself in the Mills-50 District prior to a show or a rehearsal, I stop into Viet Garden, 1237 E Colonial Dr, Orlando, FL, to order its consistently delicious Pad Tai. The service is quick and efficient and I suspect the staff recognize me since they always seat me at the same table with e view of the room. When they ask if I am ready to order, I think I caught a slight smile as the waiter waited for me to say Pad Tai. I get a Pad Tai and a Coke every time. I am a creature of habit and I know what I like. The murals on the walls offer plenty for me to look at as I enjoy my meal. Clouds were quickly sponged into place and the architecture and figures were neatly placed. A large tiger fills the hallway if you enter the restaurant from the rear door. Several times, while eating alone, people have recognized me and complimented my work. I couldn't put a name to the faces which is a symptom of the loose connections I find when conversing on Facebook. I love when I can finally put 2 and 2 together and a virtual friend becomes real.